Pour notre premiere visite d’un quartier de la ville en dehors du shopping, nous avons fait un tour a Kitano: le quartier des premiers etrangers. Kobe est une des rares villes a avoir ete tourne vers l’etranger tres tot des 710 grace au commerce avec la Chine en particulier. 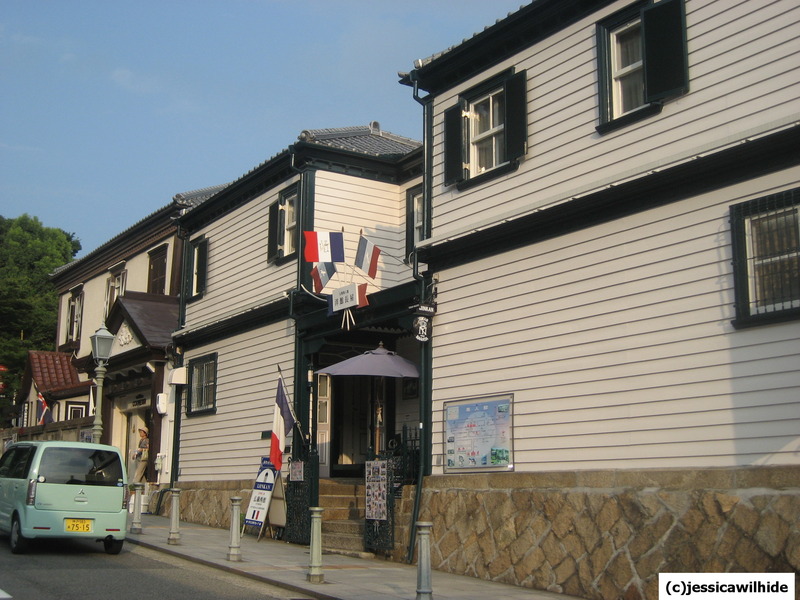 Apres l’ouverture “forcee” du pays en 1868 par le Commandant Perry plusieurs familles europeenes et americaines se sont installes a Kobe dans le quartier de Kitano. For our first sightseeing in Kobem, we went to see Kitano: the foreigner’s neighborhood. Kobe is one of the few cities in the country to be open to foreign countries as early ad 710. The city was mainly trading with China. 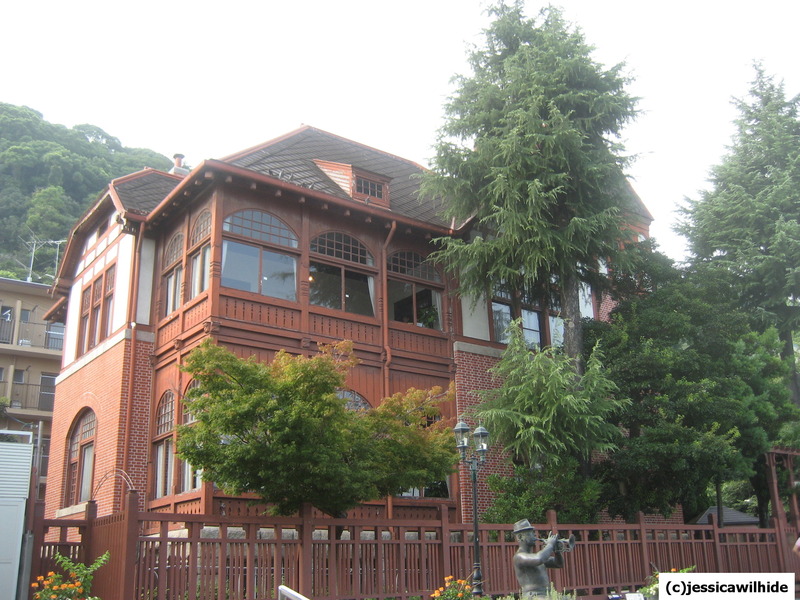 After the “forced” opening of the country by Commodore Perry in 1868, several european and american families settled in Kitano. Alors est on transporte en europe ou aux etats-unis en quelques coins de rues?Et bien non!Mais quand meme il y a pleins de maisons d’epoques a visiter telle la Weathercock House (maison d’un marchand allemand). So is this really like walking in Europe or the US?Certainly not!However, the neighborhood is spotted by houses that belonged to the settlers. We visited the Weathercock House owned by a German trader. On trouve aussi pas mal de resto Francais mais qui sont a mon gout HORS de prix (par exemple pour un repas du midi 1500 yens pour une soupe, une petite salade, un plat en sauce avec 3 patates et un cafe). Le quartier semble vouloir attirer la clientele Japonaise pour des mariages comme ca pas besoin de voyager il vous suffit de vous rendre a Kobe! I was amazed by the number of French restaurants in the area and especially by the price of lunch for example 1500 yens and you get a soup, a small salade, a plate of pork and 3 small potatoes and coffee, as usual I think it’s out of price but after all I didn’t come to Japan to eat French right! ;-) The area attracts mainly Japanese people and especially people who want to get married who use the old houses as background for their wedding pictures! 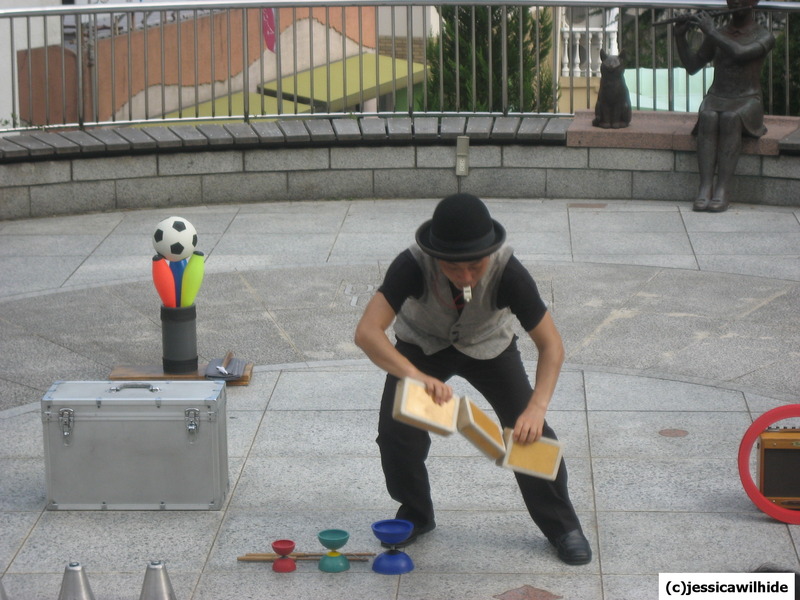 Le clou de notre après-midi aura été ce clown qui faisait des galipettes et autres tours de magie devant une foule amuser et transpirante en plein soleil et par 40 degrés! The best part of our afternoon probably was this clow who was performing bravely by 95 F and made us laugh a lot!